Google Analytics is a brilliant free tool which most web site/blog owners use to keep an eye on their traffic; however you can get a lot more information than that from it. There is a wealth of information that can be garnered from Google Analytics which can really help you plan your SEO and your site content. So I’m going to show you some of the useful information you can get, and how you can use it to your advantage. This is just an introduction to the basics, for more information you can download Google’s own guide here. When you first load your analytics and click on your website name the first thing you get shown is your traffic for the last month in graph format with like the image below, minus the red dots which I’ve added in to illustrate a point below. If you site is anything like mine you will notice that there are peaks and troughs in these stats, most sites don’t get a steady amount of traffic every single day of the week. The days I have marked in red are my low points, every single week without fail my traffic dips on a Saturday. It then picks up again start of the week and tends to peak around Tuesday. When you have a day of lower traffic you can either try to figure out why and see if there is any way you can increase the traffic on that day (putting a special offer on, a competition, a news post etc). Or you can accept that those days are going to have less visitors and try not to put your best content, your offers etc on those days as less people will be seeing them. In my case I presume that traffic is lower on a Saturday because it is the weekend and people are out enjoying themselves rather than sitting in at a computer. So I don’t fight against it, I accept there will be a dip and do not put any of my prime content new on site at the weekend. Instead I save the most important things for the start of the week when I know I have an extra couple of hundred people looking at the site. If you click traffic sources on the left hand side of the page and then click overview you are in the section that shows you how people are coming to your site. Be it from adverts, mentions on other blogs/sites, Google and other search engines or social media. This information is useful to know so you can see if any online adverts you have are worth the money, whether you SEO is working well for you and to see who is talking about you. Let’s start by having a look at the overview page above. The pie chart to the left gives you a break down as to how much of your traffic has come from search engines, how much has been referred from other sites (this includes your Facebook and Twitter pages) and how many people went direct to your site in the last month. If you’ve recently handed out a lot of flyers at a craft show for instance you may see that your direct traffic will be quite high. If you’ve been mentioned on several blogs your referral traffic will probably be high. I’ve been working a lot on my SEO (search engine optimisation) so my search traffic is quite high. The keyword list to the right is the terms that people have been putting into search engines which lead them to your site. This is useful for SEO purposes to see whether you are ranking well for the terms you want people to be finding you for. If you click on the word ‘source’ under Referral Traffic you will get a list of blogs and sites who have been sending traffic your way. It will give you the name of the site, the amount of people who have clicked through to your site from their site and what percentage of your overall site traffic came from that site. If you click on ‘Landing Page’ under the direct traffic heading you will see which page of the site people landed on when visiting your site (ie. The first page they visited). Where it says / that means your homepage, this is most commonly the top page on the list. On all of these lists it starts by showing you the top 10 but if you click ‘view full report’ on the bottom right it will bring up several more pages for you to look through. 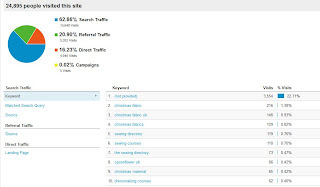 It’s very useful to see where your traffic is coming from so you can assess the effectiveness of your adverts, any guest posts you have done, your social media campaigns and your SEO. Also you may find mentions of your company that you didn’t know about. 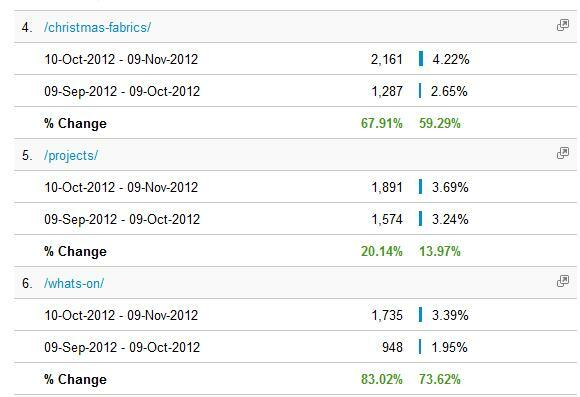 The landing page stats help you see what pages of your site are most popular. It is worth reviewing those pages to work out why they are so popular, and keep them regularly updated so they continue to be popular. Another really important section of Google analytics is the content section, it’s in the menu on the left of the page. Click content, and then overview to load a summary. The graph at the top shows you the number of page views you’ve had each day. Most site visitors will look at more than one page so this number will be higher than your visitor’s figure. 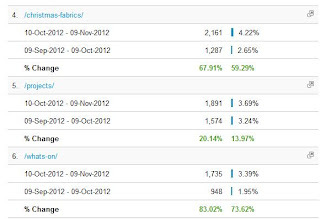 The stats underneath tell you the average time each visitor spent per page, and the bounce rate. Bouncing means a visitor only looked at one page of your site and then left, rather than looking around through several pages. Your goal is to keep people on your site, so that they look at your content/ buy your products/engage your services/click on lots of your ads or whatever the overall purpose of your site is. So ideally you want a high page view figure, to show people are looking through your site, combined with a low bounce rate. This means you are engaging your site visitors and keeping them on your site. This gives you more information about each page, how many page views it had, how long people spent on that page on average, how many visitors went straight to that page on visiting your site (entrances) and how many people looked at that page only (bounce rate) and how many people left your site from that page (exit rate). You can click the arrows on the bottom right to skip to other pages; you can also type a page number in the ‘go to’ box. For instance if I wanted to see the least viewed pages on my site I would type in 2398 in the go to box to take me to my least popular page. Now the yellow box I have highlighted at the top of the page can be used to locate a particular page (or pages) of your site. So if you want to see how many views a new product is getting type part of that page URL in that box or you can type in a keyword like ‘bag’. Do bear in mind it will bring up every page that mentions the word you type in, if you want to type the exact link don’t include the domain just the page title after. EG. If I want the stats for my page http://www.thesewingdirectory.co.uk/sewing-courses/ I would just type Sewing-courses into the search box to bring the page up. If I typed in just sewing as a keyword I would bring up over 200 pages. You can see which of your pages are getting a lot of traffic and which ones aren’t. You may want to compare the most and least popular pages to see if you can identify what makes some pages rank better than others. The pages which have a high entrance rate are normally ones getting a lot of search engine traffic, they are showing up high in search results and people are clicking straight through to that page. It could also mean that lots of other sites are linking directly to that page. Also by looking at the content which gets the most traffic it will help you indentify what your site visitors like so you know where to concentrate your efforts in the future. What if I want to look at more than one week? One other useful thing to know is how to change the date period of the data you are viewing so you can check the stats for the last quarter, or last year instead of just the last month. You can also to compare stats from one period to another. On the top right hand corner of the screen you will see a date period with an arrow to the right of it. Click on that arrow and it will allow you to change the date period, either by selecting it on a calendar of by typing the dates in. There is also a little tick box under the date (which I’ve circled in red) that will allow you to compare the dates you have selected to a previous period. You can then click to other sections of your stats (ie. View the content or the traffic sources) and it will continue to show the comparison between the 2 date periods you’ve selected. It will also tell you how much the figures have changed between those dates such as in the example below. That's really useful pot thank you! Mind if I share the link on my FB page? Feel free to share, Helen. Glad it was useful for you - Fiona is a mine of useful info! Wow. Awesome information. I'm tech illiterate, and information of this kind is SOOOOO helpful. I'm going to be adding this to my own blog. Thanks for explaining as thoroughly as possible for bloggers like me.